Artemisia is genus of perennials and shrubs that are grown for the decorative and aromatic foliage. Many varieties will survive in arid and semi-arid conditions and have feathery foliage, which adds interest and character to the landscape. 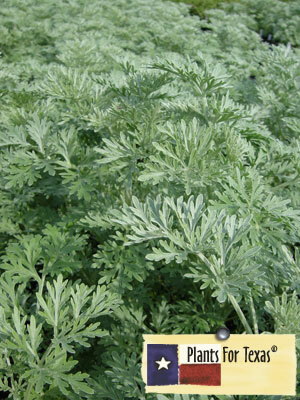 Most Artemisia are frost hardy and prefer well-drained soil and a sunny location. Artemisia x ‘Powis Castle’ has feathery silver foliage with a mounding habit of 24 to 36 inches in height. Older plants need to be cut back in early spring to encourage new growth to come up from the bottom. In colder climates this plant can be grown as an indoor plant and then planted out in the spring. Artemisia x ‘Powis Castle’ is part of our Plants For Texas® Program, meaning it was Texas Grown, Tested in Texas to perform outstanding for Texas Gardens.